Movies in the Park takes the excitement indoors! Watch the Spring Movie – Mary Poppins (PG) and take part in fun games and activities. 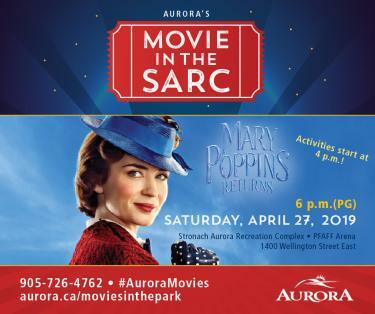 If you have experienced Aurora’s Movie in the Park series before, try watching a Movie in the SARC. The movie will be up on the familiar jumbo screen in the Pfaff Arena in the Stronach Aurora Recreation Complex. The ice will be out of the arena, so come and join the fun. The pre-movie games and activities are provided by Aurora’s Summer Camp staff. This is a great way to meet some of the Summer Camp staff and learn more about why the Town of Aurora’s Summer Camps have been known for being top-notch in York Region. All attendees have a chance to win a FREE WEEK of Summer Camp provided by the Town of Aurora. This event is FREE! Please bring a non-perishable food donation for the Aurora Food Pantry. Your help is appreciated.